Radio Guest Interview Training Confirmation - Radio Guest List.com - How to Get Radio Interviews and Find Podcast Guests! Welcome to the RadioGuestList.com Free Training Series! These free radio guest interview teleseminar classes can help YOU learn how to get radio interviews, podcast publicity appearances, and promote yourself for free "on the air". Here are the details on our free training teleseminars - exclusively for RadioGuestList.com subscribers ilke you as a "thank you" for participating in our service. Please MARK YOUR CALENDAR NOW to join us on these dates! we will also email you reminders and the call-In details shortly before each class session. Sorry, No Replays - eBook on the way! There will be no replays of these free teleseminars. BUT due to your popular demand we may be transcribing the sessions to into an exclusive new "How to Get Radio Interviews" eBook for your purchase. Please leave us a comment below if you're interested in this new ebook so we can decide whether or not to make it? Watch your inbox for updates on the new ebook coming after the teleseminar series has concluded. New here? Don’t forget to register for our main service! RadioGuestList.com is the web’s #1 radio interview and podcast publicity booking service. 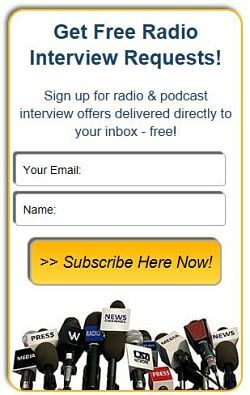 If you’d like to get interviews on the radio to promote your products, book, or services, register with us for free daily “Guest Request” emails from radio producers, podcast hosts, and more! Sign up for our free daily "Guest Request" emails here. Also, please consider advertising with us as a Featured Guest Expert? You can see examples of Featured Guest Experts here. And get details on these custom radio publicity sponsorships for yourself here.